TOO RARE!!! As as of 2006.Nov.11th, Sharpened Luggald Claw still drops. See notes under the dagger description itself. 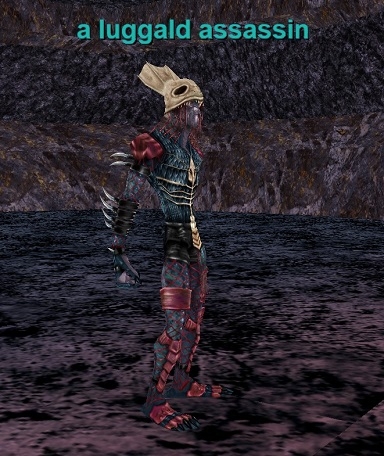 The Assassin also drops Luggald Saliva , for the necro spells Auspice and Comatose, Luggald Studies is the name of the quest. I have only seen the saliva, blood and bile drop off the assassin. Never seen it drop off any other luggald in that first room. Im a 63 pally so I can clear the entire room pretty easily before any respawn, but I'm having major difficulty getting the assassin to spawn tho, been camping the first room as you come in from secret entrance on and off for months now, (usually 3-5 hour camps at a time) and only seen him spawn twice) First time he dropped the blood, the second time he didnt drop anything. My necro got lucky once when as my pally went to check the camp there was an enchanter there that had just killed the assassin, so got the saliva drop off the assassin then. But still need the bile drop and cant get this guy to spawn again errrrrrr. If anyone has any updated info on how to get this guy to spawn faster I'm all ears. As im tired of fighting greenies for no exp and a few gems here and there. No dagger yet (got Ring). Loc is 902, -577. About 3 hours per night, for 5 nights, only one spawn so far. Guess I was confused and misread other descriptions of location. Go in secret caves, first path to the right. Only room I've been able to find with 3 around a campfire. The PH is usually "A Servant of Hate". He's one of the 3 around the campfire. The closest one to the centerline of the room running longways. Since it's such a long spawn (so far) I've been alternating between Luggald Assassin, and Enraged Soulstealer (for Soulstripper) down the "T" path off the bridge. And the Fleshchild of Innoruuk in the 3rd room on the right for the ring there. So far, buncha Soulstrippers. . . no ring or dagger. If nothing else, the exact loc above should help. 2006.3.20 update. At least a month now. Between 1 and 3 hours per night. At least 50 hours total. Has spawned two times. Easy kills for L61-66 Necro. But alas . . . still no dagger. 63 SK able to solo this guy? 6.5k HP, 1.5k AC. RE: can I drop him? I just got Luggald Blood today. Just killed this guy today. I was exploring the luggie caves, as I hadn't really gone down there much, and granted im 65, I love to explore stuff. So im running in the camp...thrashing anything that moves and he pops. so I assume he's another common mob..but he's db..everything else is an ugleh green. I slow him...sic the pet...and it chases me..any other mob and the pet gets aggro. had to drop in my spirit call AA (3 pets for 60 sec) and I barely won...pet had 2% hp left I was oom...spent alot on trying to root the snotrag to get him off of me...dropped the dagger...go Me I suppose..
and im a 65 kitty shammy with 2k hps base (i was unbuffed for the fight), 933 AC (i know..i know..) and he hit me for a max of 140...hits like a girl compared to tier3 mobs/pop mobs..
Maybe I just got lucky, or maybe there was some kind of science to it. I killed the place holder of assasin but left other 2 around campfire and killed all others in area. Got him to pop after probably 30 min. Been camping this guy for the past 2 (3 hr camps)evenings. Got him to spawn 3 times and each time he dropped the Ring . . . :( Looking to get the dagger. He is quite easy with my group. Quite easy even with adds.